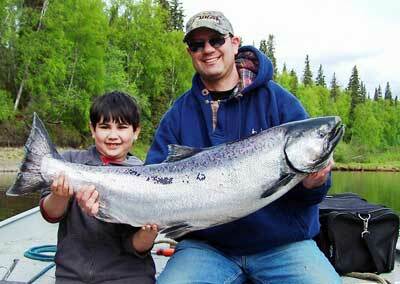 iFishAlaska Guide Service offers daily salmon fishing charters all summer starting May 14th running through August 25th. Our salmon charters are fully guided and we supply the rods, reels, tackle, bait, and at the end of the trip our Alaska fishing guides will even clean your fish! We have both early morning fishing trips as well as afternoon fishing trips to make it easy to schedule a time that works best for you and your party. We also offer extended full day trips for those who want a little more fishing time and increased chances of catching fish. Our salmon fishing trips begin at either the Deshka Landing or Little Susitna boat launch only 90 minutes drive north of Anchorage. We are the closest guided fishing charters to our largest city, which makes day trips from Anchorage easy and affordable. Let our Alaska fishing guides take you to where the fish are! 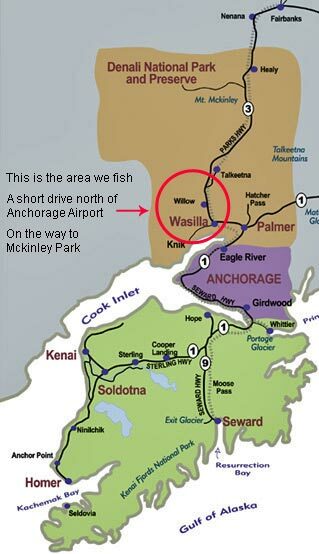 iFishAlaska Guide Service is located in Wasilla, Alaska close to several world class Alaska salmon fishing streams. We fish the Deshka River and Little Susitna River primarily, however we also take advantage of Alaska fishing opportunities in several other local streams. The nice thing about the Deshka River and Little Susitna Rivers is their close proximity to Anchorage and other popular places that Alaska visitors love to see. Our Alaska fishing guides will meet you at one of two locations in the Mat-Su Valley. Both are conveniently located near the main highway corridor which is used to get to many of Alaska’s most popular attractions. This makes doing day trips from Anchorage a total possibility. You can plan a trip with our Alaska fishing guides on your way to Talkeetna, Mt McKinley, Denali National Park, or even Fairbanks. This makes our salmon fishing charters among the most accessible and affordable salmon charters found anywhere in the state. Our Alaska fishing guides specialize in fishing for all five species of North Pacific salmon that return to our local rivers each year. One of those streams is the Deshka River, which boasts an average annual king salmon run between 18,000 up to 50,000 and an annual silver salmon run that ranges between 15,000 to 50,000. Streams like this give us abundant opportunities for out guests to catch fish and have a great time. Alaska King Salmon Fishing is one of the most exhilarating experiences a fisherman can find. These large salmon are only hours from salt water and put up a king size fight. 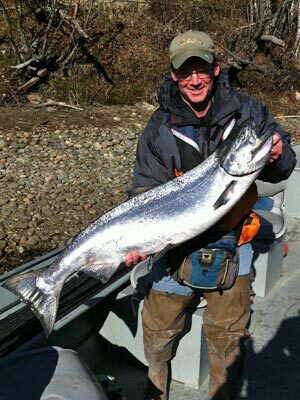 Our Alaska fishing guides operate daily king salmon charters twice daily so they know where to find fish. Silver salmon fishing in Alaska is a total blast. These fish pile into our local rivers beginning around mid July and stay plentiful in our area until late August or early September. These are aggressive biters and good fighters that provide exciting action for all ages. We operate most of our charters on either the Deshka River, Little Susitna River, or of the tributaries of the Big Susitna River Drainage. These rivers of south central Alaska are productive fisheries that provide us with many options for our guests to catch salmon. None are more productive however, than our primary fishery, the Deshka River. The Deshka boasts great returns of both king salmon and coho salmon which are our primary targets for our daily fishing charters. It’s located on the west side of the Big Susitna and is only accessible by boat or airplane, however our guests can drive to right the boat launch that we use. From there we jump in the boats and head down the Big Su to the Deshka. 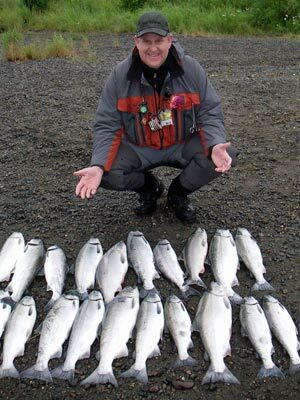 Our Alaska fishing guides are licensed by the United States Coast Guard and insured and have decades of experience fishing on the streams we will be guiding you to. We take pride in sharing a true Alaska experience with you by showing you the beauty and bounty of Alaska. Our fishing charters are among the most affordable in the entire state. Plus, you can drive to where we are, which means you don’t need to buy an expensive plane ticket to go fishing. If your shopping for Alaska Fishing Trips on a Budget, you’ve found the right spot. Affordable doesn’t mean cheap however, we’re affordable because we’re easy to get to by car and we don’t have the overhead that big lodges have. Many of those lodges charge thousands per day just to fish with them. Our service is a locally owned and operated business and we work hard to keep our costs low.